2 Bedrooms, 1 bath - sleeps 5. Air conditioners in all rooms. A tastefully renovated Andalusian farmhouse, surrounded by it's own gardens and with the most wonderful views - La Luna provides the seclusion and peace required for the best of holidays. All the comforts of home are on-hand in the spacious rooms and now available is a delightful ensuite double bedroom in the pool side cabaña, however, if you feel like getting out, there are plenty of good local restaurants, markets and shops a few minutes away. The Mediterranean is one of the views and a short drive away for the pleasures of the beach, water-sports, diving etc. All the attractions of Marbella, Sevilla, Grenada, Cordoba are there for extended day-trips - with Malaga and Nerja even closer - but - why not relax by the pool or on one of our shaded terraces and enjoy your place in the sun. La Luna: is secluded from any neighbours - and is on a private track overlooking the slopes of a verdant valley, covered in olive and almond groves and grape vines. The only disturbances may be the occasional farmer on his mule or goat herder with his animals. For those who love the sound of birds singing, relaxing with a good book - or an all-over suntan - you will find these and more at La Luna. Axarquia: - the south-east portion of Malaga province - is made up of mountains and the Mediterrean coastline. The mountains are largely protected national parks - somewhat wild and barren, with a band of varied agricultural lands on the slopes down to the sea. It's an old area - prehistoric man was here, the Phoenicians, Greeks, Romans, Moors all were visitors and it has it's own deep beauty. La Luna is in the centre of all this - with ready access to Malaga, Nerja and with Granada, Cordoba, Marbella and even Sevilla close enough for a day trip. Extra large walk-in shower, wheel chair accessible. Lots of shaded areas - beds planted with Mediterrean plants. All rooms are somewhat larger than Andalusian standards and outside we have extensive terraces and gardens. Beds can be arranged to the needs of families or couples as we provide linens for double(king-size) and/or twin beds. We have a good sized pool and the house, gardens and pool are maintained by local English speaking residents - always available to help out if needed. Apart from a step or two, house and surrounding land, including parking are on one level so no problem for elderly or infirm. Bathroom has walk-in extra large shower. The kitchen is new with quality range, dishwasher, belfast sink etc. We have UK free-to-view satellite service, large screen TV - HDMI enabled - and an internet WIFI service. Thoroughly enjoyed our stay in this rural villa. We spent most of our time in and around the pool with the water a constant 28°C. The weather was perfect and the villa had everything you could possibly need. The local caretaker, Joerg, was friendly and helpful. Contact with the owners was good - thank you. Thank you for your kind words - we continue to try to improve what La Luna has to offer - and so glad that you enjoyed your time here. What more can one say that hasn't already been said about this fantastic property in an idyllic position and having rented villas for the past 16 years this was up there with the best of them. The accommodation was spacious and the outside areas providing both shady and sunny places to sit and relax with views to die for whilst the pool provided a cool relief from the heat of the day. Facilities were second to none and the kitchen had everything – and I mean everything – that you could ask for with the rest of the property being extremely comfortable and homely with large rooms and the bed being the biggest ever! It would have been very easy just to have stayed put and shut ourselves off from the rest of the world for two weeks but for those who like to go sightseeing then there are plenty of places within easy reach. This property is well recommended and our thanks David and Jose for allowing us to share their corner of paradise – we had a great time. PS Watch out for the 'goat' man!! Thank you for your recommendation! Our grandchildren also loved seeing Antonio, the 'goat man', he really does provide a touch of rural Spain. What a lovely relaxing week we spent here. A real get away from it all peaceful holiday. The villa is cosy and comfortable with a lovely well equipped kitchen. The pool area and garden were lovely and we spent most of our day moving from pool to shaded terrace to kitchen and back to the pool again. The views are beautiful across the valley and its very easy to just do nothing! We did venture out for a couple of day trips to Comares (the hilltop village) and Cutar - both of which can be seen across the valley, and also a day trip to Cordoba and a visit to the Mezquita - which was stunning. All in all, a fantastic time - we came back refreshed and chilled and ready to face an English winter! La Luna is a beautiful villa, full of rustic charm, with colourful gardens and stunning views. It is spacious, well equipped and well maintained both inside and out. It has the most welcoming and peaceful feeling about it. The gardens were bursting with colour during our stay and we particularly loved the honeysuckle that covered the pergola. Thank you and it is wonderful to see that the improvements we try to make every year are appreciated. I can't begin to express how happy we were with LaLuna. Our time spent relaxing by the pool and easy day Tapa's made in the fine kitchen were fantastic. We were very sorry to leave but, only hope to return again some time soon. So glad that you enjoyed your stay and do hope we see you back. La Luna proves to be an amazing holiday spot. Stunning views tons of privacy and lovely gardens. The barbacue/ fireplace is a wonderful feature cause in the fall it is nice to have a fire in the evening as some of them get a little cool. The pool is great and needed as it can get very hot and a little dip helps to cool you down. La Luna is cozy and definitely felt like home. The bedrooms were lovely lots of space and light. Did I mention the wicked bathroom, I loved it, there is nothing better than a nice bathroom. Also loved the kitchen. Very quaint. All in all good times had by all and I highly recommend anyone to holiday at La Luna!!!! La Luna is in the mountains some 15 mins from Velez Malaga, 20 minutes from the Mediterrean at Torre del Mar and some 60 minutes from Malaga airport, 90 minutes from Grenada airport. We are 2 kilometres off the main road (A-356) at Lake Vinuela up a mountain road. 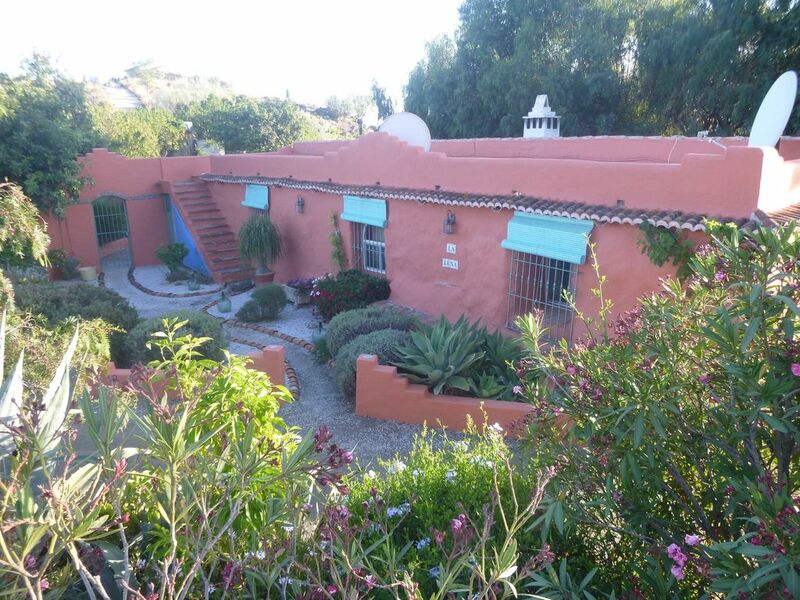 Poolside cabaña with double bedroom and en-suite shower room available at an extra cost of 200€ per week. Payment accepted in Euros – or British pounds equivalent - all payments by electronic transfer. 25% deposit required on booking, balance a month prior to arrival. Special rates for Easter and Christmas available,' contact us.